On this site we have more than 2000 English idioms and expressions along with their meanings and some examples. In some cases the likely origins are also given. Some interesting expressions and proverbs from other languages and cultures have also been included, along with a number of humorous illustrations. You can see even more on our Home Page, but first let us tell you about our unique feature. What makes this site unique among other sites of similar nature is the fact that you, the visitor, can easily contribute to the site and, in some cases, even set up your own page where others can make comments or have discussion. All done very easily, by pressing a few buttons. Suppose you know the likely origin of an expression, or you have an idea for an illustration, or you know an expression in another language that would be a good addition to our site, etc., all you have to do is click one of the many "Share it with us" buttons, and follow a few easy steps. That's it. And no technical knowledge is necessary, either! And so, with that in mind, welcome and enjoy your visit. 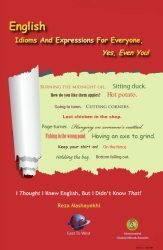 April Nelson did the editing of the book “English Idioms And Expressions For Everyone, Yes, Even You!” in its entirety. She also edited the English idioms and expressions on this site. April does great work, and you can read more about her professional services on her website at Warp Dry Proofreading. Azita Mousavi is a talented and versatile artist in San Diego. She has created most of the illustrations on this website, and will also help us as we go along. To learn more about Azita's professional services, please visit her website Azita Art. 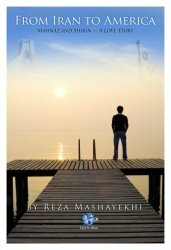 And I am Reza Mashayekhi, the founder of this site. I was born and reared in Tehran, Iran, and later attended the University of Michigan where I received a degree in aerospace engineering. I have always been interested in learning the intricacies of the English language. This is why, alongside of my engineering work, I have taught English to non-English speakers. I also consult with non-English speakers to prepare them for their public speaking events, or to help with their day-to-day conversational skills, both in the form of workshops and on a one-on-one basis. Being a non-native speaker of English, living and working in the U.S., my experience through the years and my interactions with my students and clients have given me a unique perspective towards English and its numerous idioms and expressions. 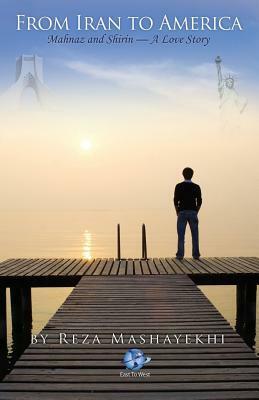 It has further led to the publication of my book English Idioms And Expressions For Everyone, Yes, Even You! and now this website!